Right after finishing the Shimanami Kaidō, Japan's longest bicycle route, we reached the little town of Onomichi. Now, it might be little and pretty ignored by most touristic guides but believe me, it's beautiful. Clean, colorful, interesting and filled with smiling people. You can't ask for more from a city! Once we gotten there, we decided to try our luck and went to the only hostel in town, obviously without reservation. When we asked the owner if we could spend the night there he promptly said : "I'm sorry, we're full tonight. But you can sleep here in the common space, if you'd like." Awesome! We started unpacking and a few minutes after, two other travellers came and checked in the hostel, Sato-san and Hiroki-san. After the usual "wow-you-are-travelling-as-well-awesome-let's-drink-together" moment, we all went to a local Yakitoriyasan and had a heck of a night, exchanging travel stories and cheering on past, present and future projects! The next day we all woke up, got ready, said our goodbyes and left in different directions, a little sad of not being able to spend more time together.. But hey, that's where the twist comes into play! You gotta know that Hiroki is doing a hell of a travel, hitchhiking through all of Japan! By pure coincidence, we found him again and again the following day, and we decided to try and meet in Okayama, 85km away from Onomichi. Thefunny thing is that the three of us actually made it in time there and we all spent another night together, camping in front of the Okayama dome! How cool is that!? 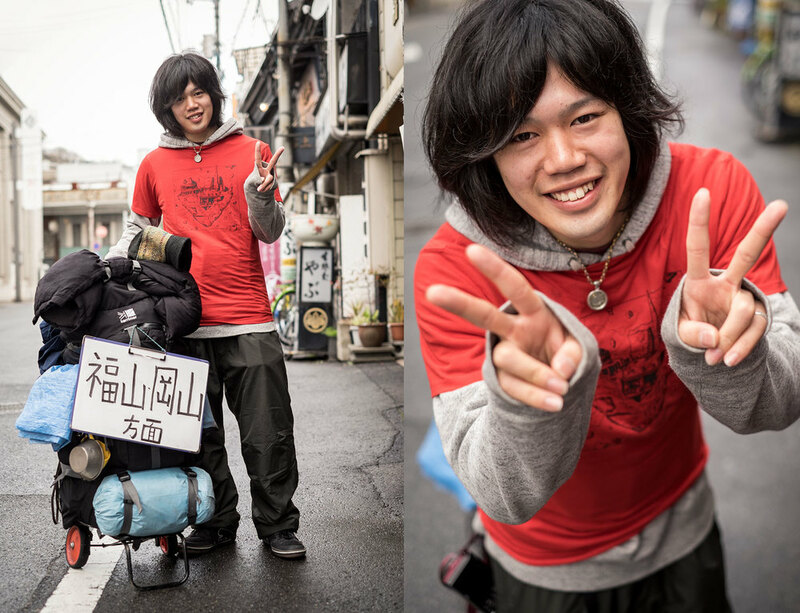 Hiroki, with the Babel Line tshirt we gave him, ready to go onward with his hitchhiking trip. The next morning, this time for real, we said goodbye to Hiroki wishing him all the luck in the world for his amazing adventure and started cycling towards Tottori. 150 km of uphill climbing and mountains. At least, that's what we'd been told all the time. Everytime we mentioned going to Tottori, everyone would look surprised and said things like " Are you crazy? You gotta cross the mountains to go there, it's impossible!" or " You better like cycling uphill, cause that's all you will do for a few days". So, armed with the worst fears ever, we begun our ride and, little by little, in two days we reached the highest peak of the mountains and there, awaiting for us, there was nothing less than 30km of non-stop downhill road! And after that, Tottori, at last! The view form the top of the mountains. From this moment on, we had 30km downhill! 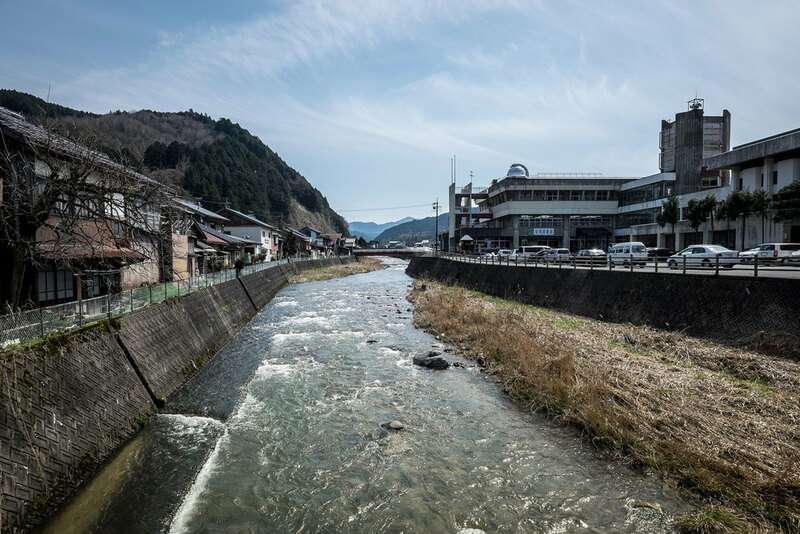 Once we got to Tottori, after the usual "arrival routine" (a visit to the hot spings to clean up and finding the perfect spot for the tent) we went once again to a Yakitoriyasan to eat something. There, we met Decchi and Soya, two gardeners-lumberjacks there for business and the party started! Fast forward a couple of hours and we were in a Karaoke booth, singing Beatles songs all together! With the sakura blooming, people start enjoying spending their lunch break outside! 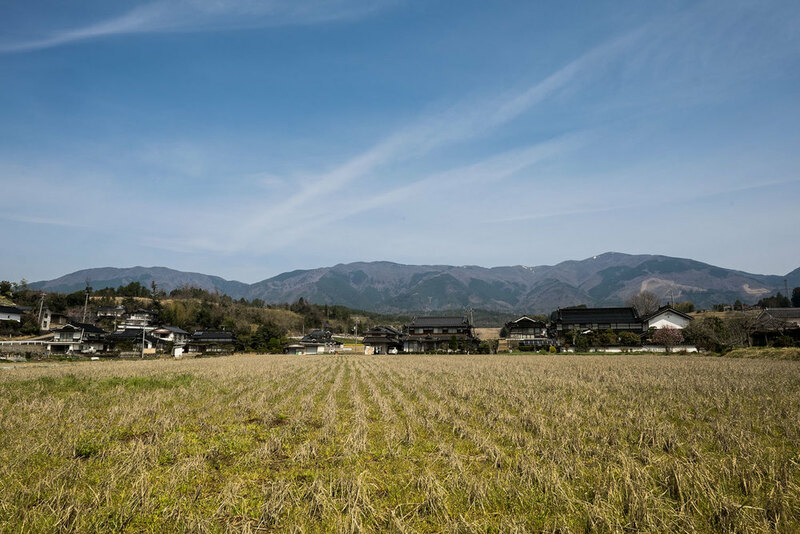 The next morning we left our luggage in the station's coin lockers and biked to the Tottori desert, the only visitable desertic part of Japan. 28 square kilometers of gorgeous desert, with its natural sand dunes going all the way to the sea, unexpectedly crowded and definitely fun to a level we couldn't imagine! 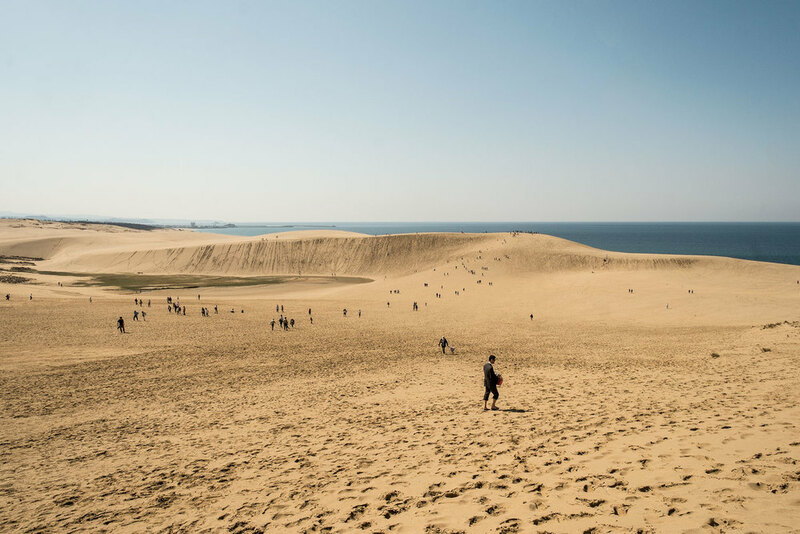 Another view of the Tottori sand dunes. You can even ride camels! Sio enjoying the long forgotten pleasure of digging holes in the sand! 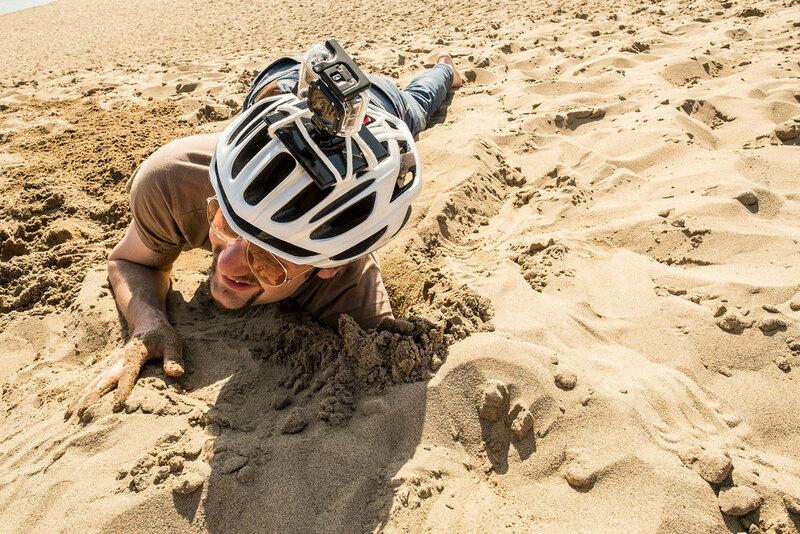 After a few hours of running up and down the sand dunes, digging holes for no reason and so on, we decided to uplevel everything and went sandboarding. 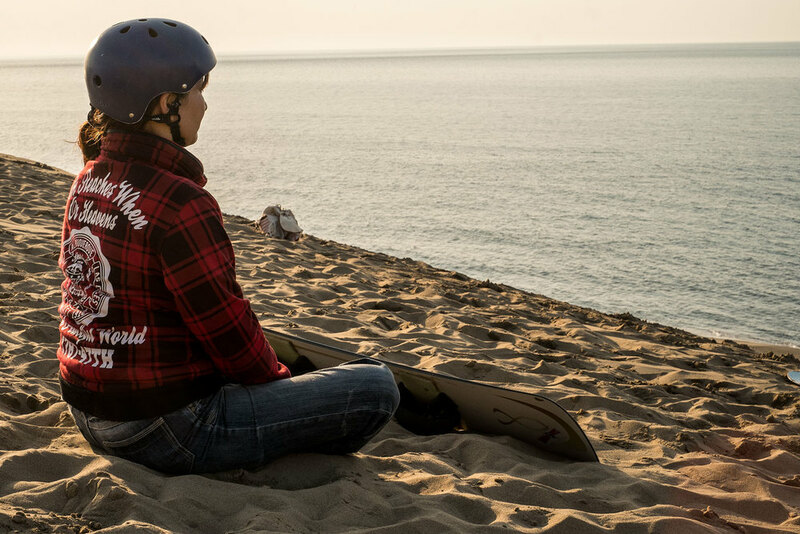 You, you got it right, Sandboarding: snowboarding on the sand dunes! Despite having to accept the shocking truth that we are absolutely not cut off for this kind of sport, it was without any doubt the most fun we've had in a long time! Exhausted and happy like little kids on christmas morning, we sat down with a locally brewed beer and watched the sun disappear behind the sand dunes before heading back to the city and going to sleep. The sunset of the Tottori desert dunes. The following day we left Tottori and started climbing all the way back across the country, heading to Osaka. The first day, probably still tired from all the sandboarding fun, we couldn't ride more than 50km and stopped in a small village called Yumura, knows for it's natural hot springs. Once there, we started asking around for a place to pitch the tent and the local tourist information officer directly escorted us to an aera right outside the village, with a lot of abandoned buildings. We set up the tent under a woodshed as it was staring to rain and went fell asleep. Not even an hour later, we heard a voice coming from outside the tent and immediately thought : "Here comes someone telling us we can't pitch the tent here. Dammit, it's raining and I don't want to pack everything up just to find another spot". Turns out it was a guy telling us that his band was coming any minute and that, since they use one of those abandoned buildings as rehearsal studio, it might have gotten loud for a while. 30 seconds after, we were inside the studio with them and spent a good half hour listening to them practicing and getting to know them! How freaking cool is that!? The natural hot springs of Yumura. Once we woke up the next morning, it was still raining a bit but we decided to ignore it and started riding towards Osaka. We couldn't expect what came next : our of the blue, it started seriously SHOWERING on us and the temperature dropped to around 5 degrees. For as long we we were climbing uphill, we could stand it, but once we got to the top of the first mountain and started descending towards the valley, the real problems kicked in. Soaking wet in the cold, we couldn't even hold the bicycle right from how much we were shaking. So we opted for a first stop, to warm up a bit and to change socks. After a while, we tried again but not even 5 minutes after, we found ourselves in the same freezing situation as before. After not even 25km, we realized it was impossible to go on and called it a day, went into a small cafè and spent the whole day working there. Since the rain had turned in hail and it was getting kinda late, we went to the local hot springs for a bath before pitching the tent somewhere; when the hot springs owner heard that we were looking for a place to set up the tent, he said "C'mon guys, it's too cold outside. You can sleep here, inside the hot springs for the night. I'll give you the keys of the building. Overwhelmed with gratitude, we obviously accepted his offer and spend the night warm and cozy inside while it was pouring hell outside. When we woke up, it wasn't raining anymore. It was snowing, instead. lol. Regardless of the snow, we decided to leave as soon as we could and that turned out to be a wise decision: right after reaching the mountain's top, it stopped snowing at once and in the blink of an eye, the weather turned perfect and we rod pleasantly until Aogaki, a small village in the first valley right after the mountains. We had dinner, spent the night chatting with a group of adorable older folks and the next day we finally got to Takarazuka, 20km away from Osaka. Don't forget to take a look at the latest vlogs!! I'll link them here for you! 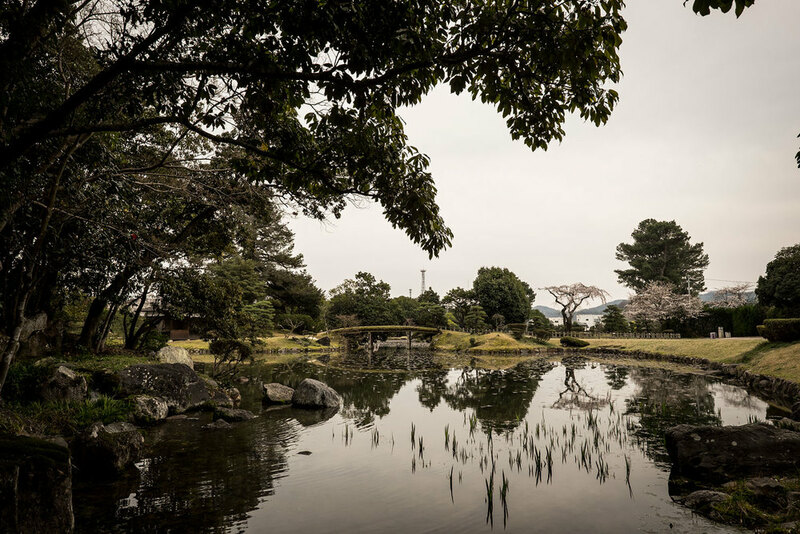 #05 : Hiroshima, more bombs, Dogo Onsen and Japan's longest cycling road.